Imaginative play is one of the most important forms of play for children ages 3-7. While using their imaginations, children learn how to interact with the world and other people. They can problem solve, explore emotional issues, and develop cognitive skills. All of which will help them deal with real-world problems for the rest of their lives. Humans have recognized the importance of toys for young children for thousands of years. Anthropologists have found handmade dolls, balls, games and other toys in historical sites all over the world. There is no reason you have to make these toys yourself; there are many wonderful toys available today. Blocks like these used to be in every kindergarten classroom. But the push for advanced academics and reduced funding means less time for kids to play with simple blocks like these. The skills these blocks teach are necessary for every girl and boy. Wooden unit blocks are heavy, so using them builds hand strength, and are made in ratios of a whole, half and quarter sizes. This helps children develop an innate sense of math and fractions. Blocks can become castles for queens, roads for toys cars, tall towers and furniture for other toys. The open-ended nature of a set of blocks means that they can be played with again and again in different ways, making them an excellent investment. Playing with blocks helps children develop an affinity towards engineering and physics too, as they see how to balance and shape their buildings and towers. A large set means that multiple children can cooperate to build larger castles or towns. Knowing how to work as part of a team is an essential skill to learn early. Every child should have a doll. Boys and girls both benefit from doll play. Doll play allows children to imagine themselves as parents, caregivers, big brothers or sisters. 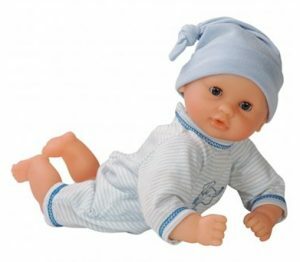 I love the dolls from Corolle because they have sweet faces with eyes that close when you lay them down. They come with a range of skin colors and in clothes of blue, pink and other choices. Most of their dolls have a soft body that makes them comfortable to hug, while also having realistic faces, arms, and legs. If you are concerned that your child won’t be excited about their new doll, get them a stroller. My son adored taking his dolls for a walk, and so did my daughters when they were small. Dolls also have wonderful accessories to encourage children to learn self-care skills. Dressing dolly teaches them to dress themselves, for example, which helps them become more independent people. Wooden Train sets teach children another form of engineering skills. As they figure out how to put together loops, figure eights, and more complex tracks, children develop problem-solving, visual processing and motor skills. Putting together the tracks builds hand strength, too. While this toy is often given to boys, my daughters also loved playing with trains. This toy is fun in that it can be added on to, again and again. You can start with a small set and ask family members to gift trains or track to add to your collection. This cuts back on the total number or random toys you have nowhere to put, as you can just add it to your box of train toys. Every child should have access to sets of small dolls or miniature figurines. These dolls can allow children to have adventures in many ways, and experiment with social interactions between their toys. Playing alone or with friends, children use these toys to act out or mimic adult interactions. They pretend to fight and make up. They injure and help each other. Children explore family dynamics practice navigating real-life situations. Through play they can have both sides of a conversation–make a mistake and apologize, for example–which helps them develop empathy. For this type of play, it is important to find toys that appeal to your child. 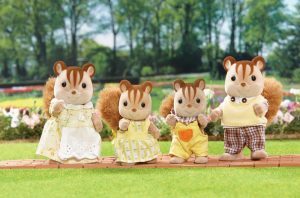 Sensory seeking children who like playing with family groupings will enjoy the fuzzy bodies of Calico Critters–which I find too cute for words. These little animals have doll houses, cars, and friends of many different zoological backgrounds, which keeps things interesting. Children who want to seek adventure may enjoy Playmobile more. Playmobile has the added benefit of having a very wide range of themes available, so your child can act our their latest obsession, whether it is Ancient Egypt, African Animals or Fairytale adventures. I like that Playmobile is gender neutral in their playsets. Boys and girls can play together and explore playing with dolls of the opposite gender. Playdough might be the best bang for your buck you can purchase today for a child. 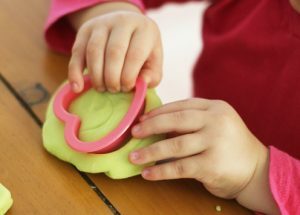 Playing with playdough builds hand strength, fine motor coordination, and has endless possibilities. My favorite way to play with my kids was making “cookies.” Children who practice real-life skills like baking will be more interested in learning those skills later. Learning how to use a rolling pin and cookie cutters increases fine motor coordination. Playing with tools builds hand strength and teaches cause and effect. The imaginative play of this toy is wonderful for children who struggle to create more complex play. Children can simply “cook” for friends or family members who pretend to eat their creations. They can expand to cooking for pretend people, their toys, or pretending they have their own bakery, without the need for a complex plot line. I found this to be an easy activity to do with my children since I didn’t have to follow a plot line. I would demonstrate how to use the tools and then sit back and say “yum, yum, yum” over and over. This was a great activity for the kids to do while I nursed a baby and kept everyone happy. The one other toy I think every child needs is something to ride. Many young children don’t yet have the coordination for a bike. 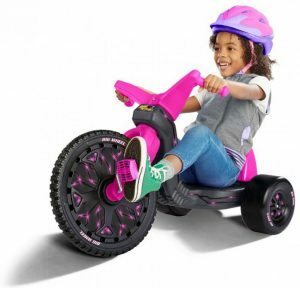 But ride-on toys, like Big Wheels and the Razor Rip Rider, help children learn to steer and pedal at the same time. This can prepare them for traditional bike riding later. These types of ride-on toys require very little balance, too. Balance can be something many young children struggling with gross motor skills lack. And, even for kids with great motor control, balancing a bike can be scary at first. By giving your child a way to enjoy racing around, and develop the underlying skills, with these, you can set them up for bike riding success. I love the bilateral coordination that children get from pedaling a bike or trike. It creates pathways across the brain that can help with many other tasks. The core strength and endurance from riding these toys can help children sit still in class and do many many other tasks every day. Best of all, children get wonderful vestibular sensory input from riding any type of toy and helps them develop balance, coordination, and body control. Children need time away from screens and school work to play and develop their minds and bodies. Toys like these, and the time to play with them, help children develop the underlying skills that will serve them well for life. P.S. Here are the links to the toys I’ve recommended today. Do you know someone who needs to read this? 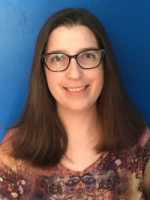 It just takes a second to share this article with friends and family. We appreciate it and we are sure they will, too!